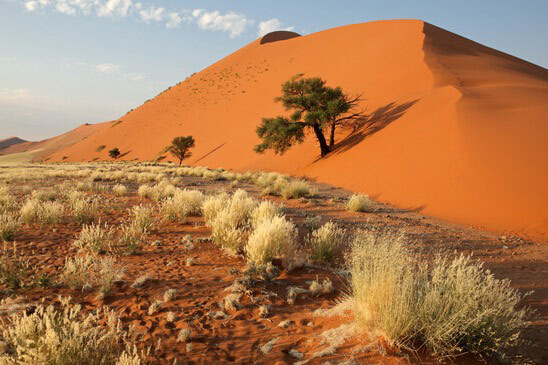 In the region of Sossusvlei there is simple yet highly robust flora. Typical of the area are the Nara melons, which are among the cucurbits. The roots of this endemic plant reach up to 40 meters in depth, where the plant is supplied with water. Actually, the entire plant consists of thorns, twigs, and scrub. During the african summer those yellow-orange fruits ripe to a diameter of about 15 centimeters. For the animals of the Namib Nara the melon is a real treat. Animals are vital to the Nara melon survival as they assist in the dispersion of seeds. But not only the animals appreciate the fruits. Locals in the are enjoy the fruits dry pulp and seeds as a treat as well as depend on the medicinal properties . Studies show that Nara Medical has proven to help stomach pain, as a natural sunscreen as well as a wound treatment. 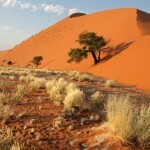 At Sossusvlei, the bizarre looking camel thorn trees are abundant in the area. They can be up to 16 meters tall and have an impressive taproot system that penetrates through the dry soil to reach the groundwater. They grow predominantly along watercourses. In addition to the high heat this tree can cope in, it is also capable of surviving frost. Although the name suggests the trees have something in common with camels, this is not the case. Rather, the name came from the Afrikaans word for giraffe, as they are particularly fond of eating the leaves from the top branches. No other animal comes close to these leaves and they are especially tender making them perfect for long-necked giraffes. The crescent-shaped fruits are up to 13 centimeters long. These are eaten by cattle and wildlife that live in the area. The locals also take advantage of the camel thorn tree and brew a lovely coffee from the seeds. Medically, the crushed seed is used to treat ear infections. If the roots are boiled, the brew can help for toothache and tuberculosis. 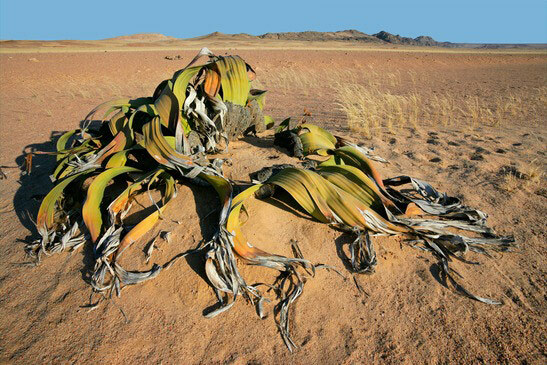 The Welwitschia grows only in the Namib Desert. It is a very peculiar plant that consists of only a single pair of leaves. These plants are almost 2,000 years old. In 1859 it was discovered by the Austrian botanist Friedrich Welwitsch, which the plant owes its name. Although the plants looks like it made up of a number of individual plant leaves, these are actually groups of single Welwitschia plants. The plant leaves absorb moisture from the air. 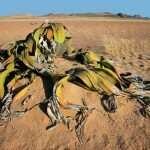 In Europe, the Welwitschia grows only in botanical gardens or as a private ornamental plant. The plant is not frost-resistant and therefore it cannot grow in the wild in these parts.